There are two ways that you can change the categories and productivity rankings for your activities. Select Categorize Activities from the Tools menu. This page will list your activities for the week in decreasing order of time spent on them. In the "Activity" column, you will see the activity name listed. 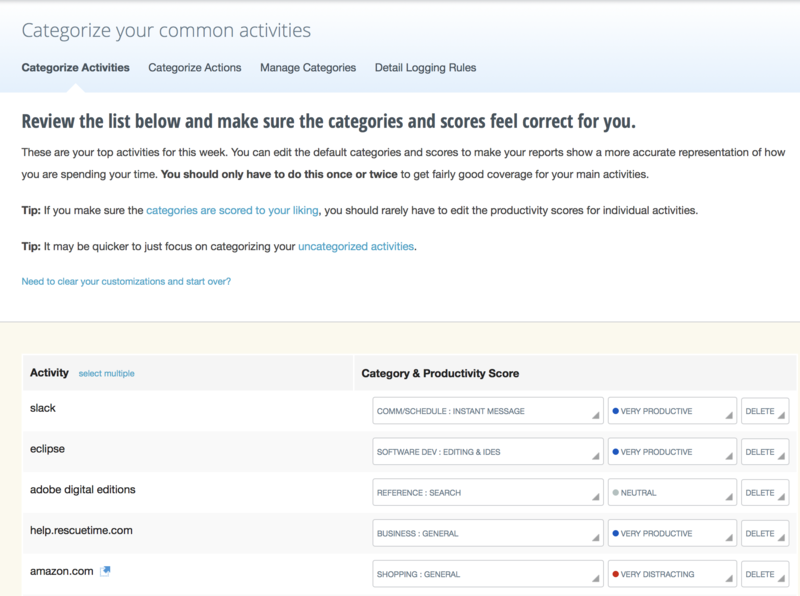 The "Category & Productivity Score" columns, show the current categories and productivity rankings for these activities. The boxes displaying this information also serve as the editing interface. 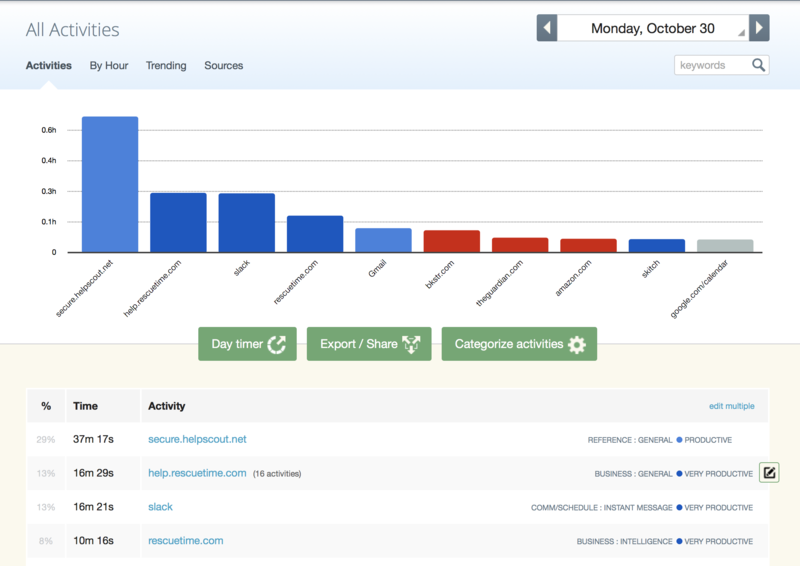 The first item is the Category box, which displays the current category of the respective activity (i.e., the activity "help.rescuetime.com" with the categorization "Reference: General"). 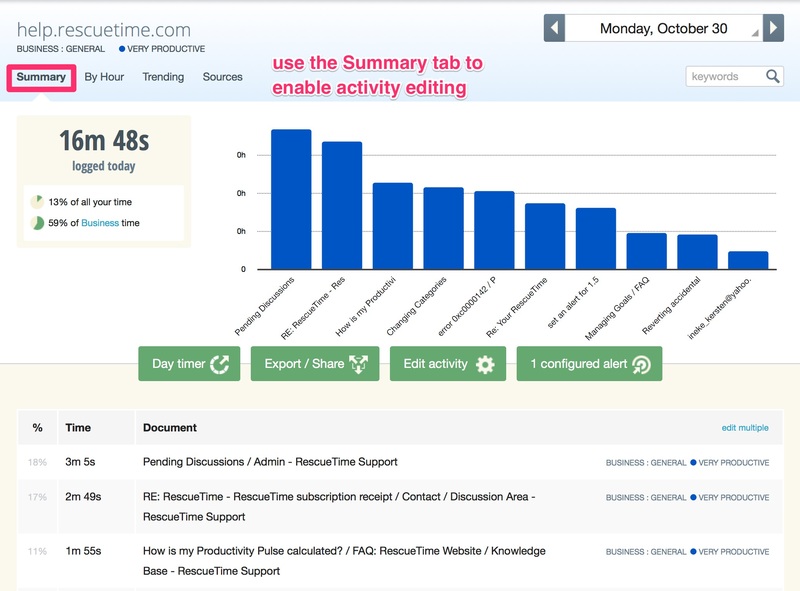 To change a category, click on the category box and you will see a list of all the main RescueTime categories (i.e., "Business" and "Communication & Scheduling"). When you hover over the main category name, you will find its subcategories ("Business: General," "Business: Accounting," etc.) Select one of these to assign the desired category to the activity. The second item is the productivity score box where current ranking is displayed. To change it, click on the box to open up a list of the five productivity rankings and assign the desired ranking. Click Delete dialogue box to delete an activity from your records. You will have two options: (1) "Delete this XhoursYminutes" or (2) "Ignore this activity forever." The first option will delete only the specified amount of time spent that week in that activity, as indicated. The second option will erase the activity from your records altogether and also prevent it from being logged in the future. A list of currently ignored activities is available in your Privacy Settings where you can choose to unignore them if you wish to start recording time for them again. Right next to the Activity heading you can click on the select multiple link to categorize various activities at the same time. "Categories are scored to your liking": It will take you to the general category management page. "Uncategorized activities": It will take you to a list of only those categories that are currently uncategorized. "Show X more activities that had a very small amounts of time logged": It will expand your list of activities to include all of them, even ones with very small amounts of time. You can edit category and productivity scores directly from the Applications & Websites Report. Hover the row for the desired activity in the report and a paper-and-pencil icon will appear at the far right of the row. Click on it to open the editing dialogue. You can then change category and productivity scores or delete the activity, as previously described. You can also similarly edit sub-categories, though this is a Premium-only feature. Click on the name of the parent activity; it will take you to a new page with a list of all the specific activities under that parent activity. To edit these particular activities, click on the Summary tab on this resulting page. You will then see the main editing interface as the main Applications & Websites Report. Both of these pages also have an "edit multiple" link on the upper right that allows you to score multiple activities at the same time. What are categories and how are they assigned?